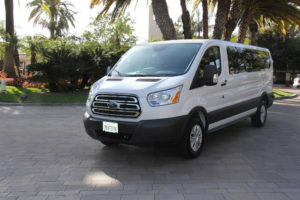 At Orange County Van Rental we have a substantial fleet of 11 passenger van rental orange county available to rent. We ensure that each of the vans undergoes timely maintenance so that the fuel efficiency is high, the air conditioning functions correctly and any auto part that requires a fix is attended to. There is a periodic check of all vans to be sure that they meet the required safety standards. Our 11 passenger rental vans are fully loaded Express vans with Automatic Transmission, Air conditioning, Auxiliary Audio Input jack (opt) and CD player. The 11 passenger vans come with extra cargo room for a big group traveling to SNA John Wayne Airport with multiple pieces of large luggage; this allows the van to seat 11 passengers with plenty of room leftover for big suitcases in the back.